Northridge Media is notorious for putting out some stellar crafting inspiration in its extensive lineup of magazine and idea book titles. 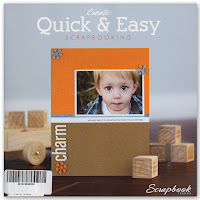 Their recent Quick & Easy Scrapbooking Idea Book is certainly no exception to this rule. The idea book is sectioned into 10 parts - each with many featured projects and the editors are always sure to point out special, yet simple, techniques to make your projects shine. FAMILY: Includes 7 layouts with various themes to help you showcase special relationships. PROJECTS: Includes 7 ideas for wonderful home decor and gift items - including one sweet display item that takes less than 15 minutes to create. QUICK & EASY SKETCHES: Includes 8 steps to success when using sketches as a starting point. There are also 3 sketch designs shared, each with 2 variations - one in a 12 x 12 format and the other in an 8 1/2 x 11 format. MINI ALBUMS IN AN EVENING: Features 5 great album ideas to help you record what you most wish to remember about you favorite season, a year in the life of someone you love and much more. CARDS: Includes 13 cute card designs including everything from 'just because' to birthday wishes. 4x6 PHOTOS: This section of 11 layouts proves that you don't have to go BIG to create a fabulous layout. 2 PAGE LAYOUTS: 7 layouts are featured that showcase simple ways to feature lots of photos. I was very lucky to have a layout of my own featured in this section of the book (called "gallery of a year"). I'll share the layout with you in a separate post later this week. EMBELLISHMENTS: Often the adding of embellishments can be the most time-consuming part of scrapping, but these 9 layouts show that embellishing doesn't have to be tedious. ONLY 5 PRODUCTS: Sometimes the best way to speed things up in the craft room, is to limit your choices. These 9 layouts show that you can still create a stunning layout with limited supplies. SIMPLE THINGS: Includes 7 layouts that showcase simple techniques that can add serious pizazz. If you tally that all up, that's EIGHTY-ONE amazing projects to inspire some speedy, yet sensational, crafting!! Don't ask me how, but I've had this idea book review in my line up for a few months and somehow forgot to post it!! Crazy! Now that I've discovered my mistake, I feel I must make up for the delay. So...I have not one, but TWO free copies of Quick and Easy Scrapbooking to send off to two lucky readers. Just leave a comment telling me your favorite time-saving tip when it comes to scrapbooking by Thursday, May 27th, 2010, 11:59 p.m. and you'll be entered for your chance at one of the two free copies! !